In the next thrilling installment of D+R Tool Storage Week, please indulge me and take a moment to consider the delightful complexity of 1960's Los Angeles. 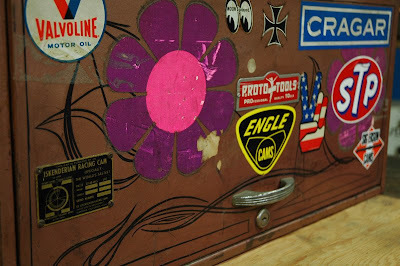 Can a toolbox explain all that? 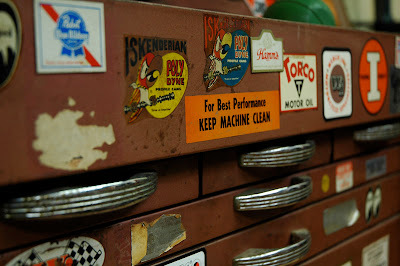 No, probably not - but a pair of the right toolboxes can start to tell the story. 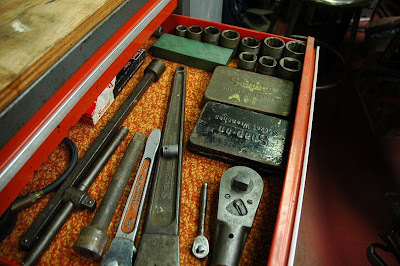 These Proto and Craftsman toolboxes were purchased at separate LA garage sales and the difference between them goes far beyond brand. As everybody knows, the large aerospace companies of Los Angeles have long since abandoned California and, in their wake, the character of established blue collar neighborhoods like my beloved Burbank has fundamentally changed. If you didn't work for Lockheed, the chances were pretty good that you worked for one of the hundreds of southland machine shops that provided sub-contracted components to the big aerospace companies. 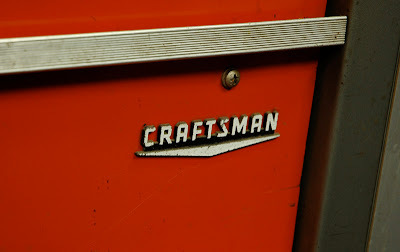 The Craftsman was purchased from a Burbank machinist who worked at one of the feeder companies for Lockheed. He was likely a specialist that worked on a single machine all day with this little roller holding the tools required for the job. 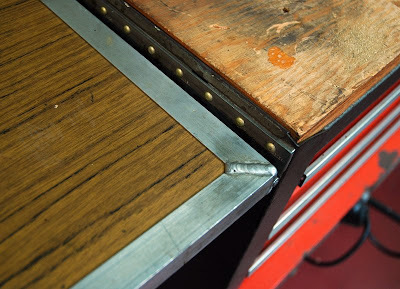 Over the years, the toolbox learned what it needed to be and the owner added a side cabinet with a worktop for dirty work. 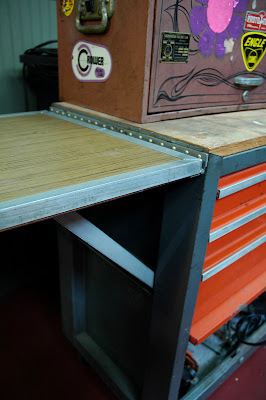 The left side gained an ingenious folding shelf that should have been included from day one. Meticulously maintained, the drawers are lined with electric orange carpet and the side shelf is wood grain Formica that probably matched the owner's living room. On the other side of Los Angeles, I bought the Proto cabinet from the estate of an Echo Park biker. Beat to hell and filthy, the interior required an entire afternoon of cleaning with wood matchsticks and a toothbrush. 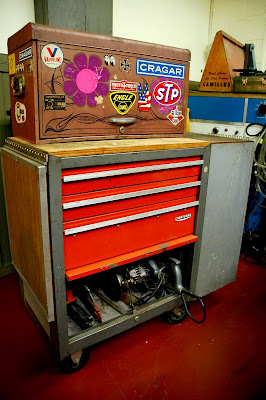 Rather than upgrades to functionality, the Proto box shows its years in ephemera...decals for speed equipment like Crower, Engle, Caster Cheater Slicks, Cragar and Torco, pit passes from So Cal's legendary Irwindale and Lions drag strips, Pabst and Hamms refrigerator magnets. 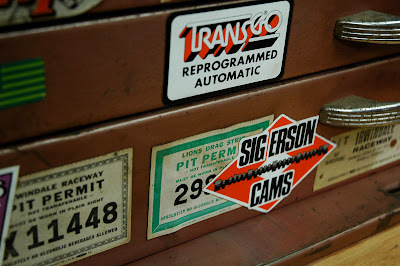 The Isky cam specifications metal plate that was meant to be pop-riveted to the firewall of a race car only made it to the toolbox lid. Amateur pin striping practice lies under the whole mess. 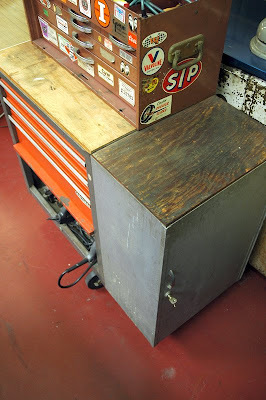 Though it is certainly possible that the owners of these tool boxes may have raced side by side at the drag races, I suspect their paths would never cross outside of that venue. 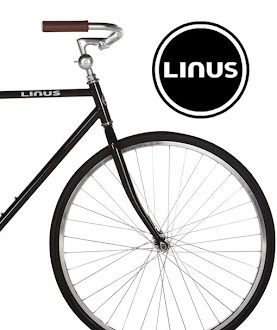 The end of the post-war blue collar suburbs up against the acid-tinged, metal flake chopper outlaws.